In the 21st century, everybody wants to add latest technologies to simple tools and make them the gadgets of ultimate efficiency. But what’s happening is things of daily use like electric razors are making life easier for many people but not ecofriendly at all. For this very reason, the traditional straight razor, also known as the cut throat razor and open razor, is making a slow but gradual comeback in today’s world. But before starting on the reasons why people are preferring this old tool for shaving, we must explain what it is and from where it originated. Most youngsters nowadays, don’t even know what a straight razor is in the first place. So, if you are included in this category then, you shouldn’t feel bad and, just keep on reading this blog to know about it. The open razor is simple foldable shaving blade that closes lightly into its handle and it has a single edge, so as long as its closed, it poses no threat to the person holding it. We wanted to explain the merits and demerits of using straight razors, so it’s only fair to talk about their history and the conditions under which they got invented. The cavemen are still represented as big hairy apes and it has its reasons. The people at that time did not have the right tools to keep them all shaved. Yet, they had used either basic stone tweezers or seashells with sharp notches to pluck their excessive hair to get rid of lice, small parasites or fleas that came along with them. But eventually this practice became obsolete, thanks to the lazy people who invented the flint blades around 30,000 BC. The new innovation, at that time, helped men shave off their hair finally and it obviously consumed lesser time in comparison to plucking out their hair one by one. Using flints, the prehistoric man fashioned sharpened seashell blades to tend to their shaving needs. Then came the time when mankind finally invented metalworking, around 3000 BC, and the ancient Egyptians and Indians were found out to be using copper-alloy razors. 1500 years later, Egyptians switched over and started using bronze razors, which proved to be a great improvement in metallurgy and perhaps laid foundation to the current swords, knives and daggers that people use today. Historians recall that it was Alexander the Great who first ordered his armies to shave off their beards, so they can look more civilized and even after his demise, soon after, the soldiers kept on shaving their facial hair that made the public follow them in turn. Then almost at the turn of 18th century, shaving technology revolutionized as the first ever known straight razor made its appearance in Sheffield, England (in 1680). Within the next hundred years, everybody had access to high quality open razors for shaving in the comfort of their homes. Now three centuries later, we have all the technology available to keep ourselves in tip top condition, regarding the matters of facial hair, because of safety razors and electric shavers etc. But, we still need to keep some old practices ongoing as there are no replacements for them. So, why people are gunning for straight razors once more? The most probable answer lies in the experience that comes with use of the straight edge razors, which never leaves a barber’s side even in the modern world. People that shave with an open razor often recall their experience as extremely pleasant. They say that the shaving foam’s smell, and no burning effect of the blade afterwards, makes a straight razor shave best in the world. Once you have bought this barber blade for yourself, you never have to go out every few days to purchase disposable cartridges. So that’s another good reason, that helps you save both time and money. As time is money as well— you end up richer! Many people that use these blades for shaving in the current times received their straight razor shaving kit or just the blade from an elder in the family i.e. father or grandfather. If you start using this blade, then one day you can pass it on as part of your legacy to your child and he can then pass it on to one of his children. When you get done with making yourself all handsome and attractive for the ladies, you end up throwing the disposable shaving razors in the waste every time. This practice just adds more trash in a world where disposing it safely have become a great challenge in itself. Thus, using the traditional shaving knife, you save yourself from polluting the environment. 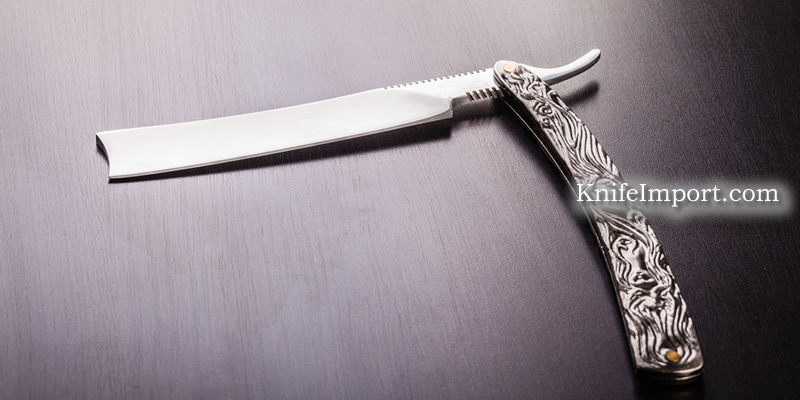 In case, you are now thinking of buying a straight razor for sale or yourself then just peruse through the vast online catalog of Knife Import and find the best shaving blade you can on cheapest rate. But, you must know about the demerits of this blade, just to be sure whether you should commit to this lifestyle or not! When you think about safety and disposable blades, you never have to think about maintaining them. However, maintaining and/or sharpening a straight razor is crucial for it to be useful for a long time (even generations in most cases). If you are not one to stay alert during shaving your facial hair, then perhaps a straight razor for sale anywhere is not supposed to be yours. As you need to pay lots of attention, at all times, when using the shaving knife. Because of this a morning shave is out of the question for many people that use straight edge razors. The disadvantages mentioned earlier can also become advantages, as it’s just a matter of perspective. If someone wants to put in time to maintain the blade and stay alert while shaving, then who can stop from availing all the good things that come with using straight blade razors. We are now trying to end this blog as any further discussion will make it a very long read and perhaps boring, for which we think you might not have the time or patience. So, in our opinion, it’s best to leave the way of sharpening straight razors and which of these blades are the best can be left for another blog, which will be posted sooner than later, most probably!